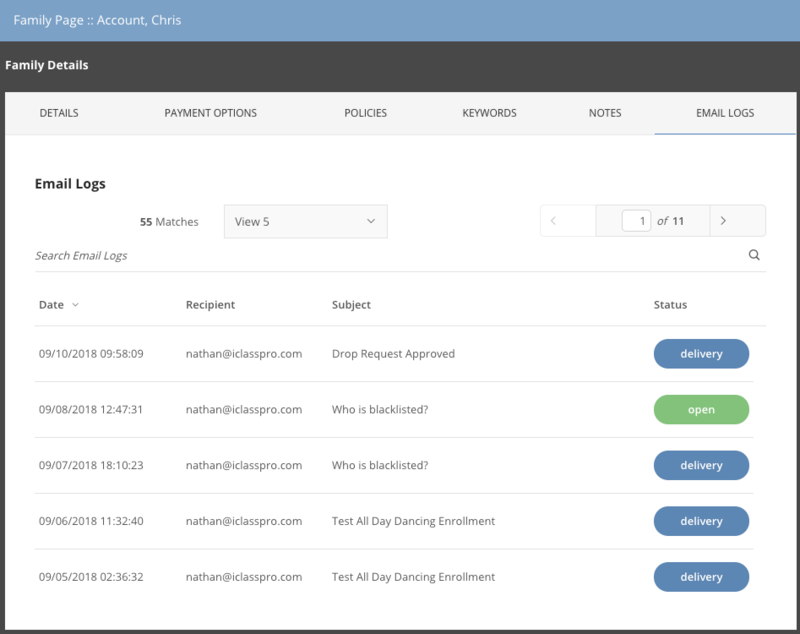 We're introducing an Email Log tab on the Family and Staff Record. This tab allows business owners to see a history of emails sent to a specific family or staff member. The log shows the date of the email, the email address it was sent to, the subject, and the delivery status. If an email address has been blacklisted, there is also an option that allows business owners to reset the blacklist status. The Email Log is searchable by all fields and can be sorted by date, recipient email address, or delivery status. The option to view both Family and Staff Email Logs will be given to all members of the admin group by default. There are two permissions for other users that are disabled by default -- one to allow them to view the Family Email Log and one for the Staff Email Log. These can be enabled per staff user group under SETTINGS > SETUP > STAFF SETTINGS > USER GROUPS, or granted to individual staff members by clicking the "Advanced User Permissions" button the PERMISSIONS tab for their staff profile on the STAFF page.